Belize NMS: A relatively moist northerly airflow will continue today and tonight, then drier conditions expected. 24-hour forecast: Some cloudy spells with a few showers and isolated thunderstorms mostly inland today, then over the sea and along some coastal areas tonight. General Outlook: For Thursday and Thursday night is for some cloudy spells with showers or thunderstorms generally isolated, except for a few over southern and some coastal areas. Today N 5-15 kts Choppy 3-5 ft ISOLATED SHOWERS OR THUNDERSTORMS. Tonight N-NE 5-15 kts Choppy 3-5 ft A FEW SHOWERS AND ISOLATED THUNDERSTORMS. Tomorrow N-NW 5-15 kts Choppy 3-5 ft SHOWERS OR THUNDERSTORMS BECOMING ISOLATED. 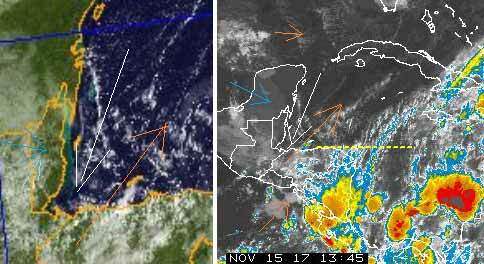 Outlook N 5-15 kts Choppy 3-5 ft ISOLATED SHOWERS OR THUNDERSTORMS. 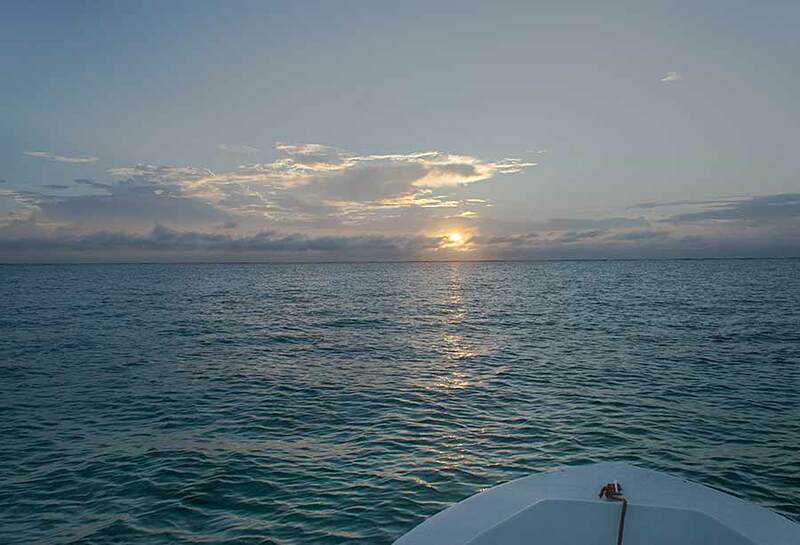 On Ambergris Caye this morning the sun is out and sky clear, a welcome change from last week's rain and overcast. The wind is from the North-NW at 10 mph. Our expected high today is 84 f.
The weather is changing, at least for us. 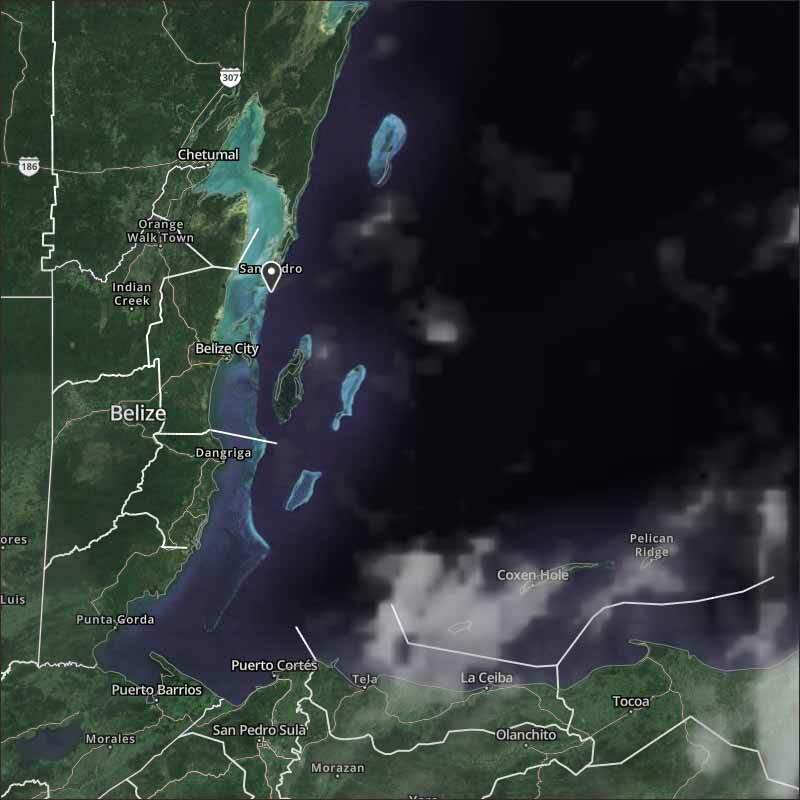 The ITCZ activity has moved a little further east, away from Belize. The main air and cloud movement is still from the NNE Caribbean air, but there is lower cloud patches moving in from the WNW which I saw traces of yesterday just starting. This is, I believe, as a result of the cold front that was in the Gulf a couple of days ago. Right now, there is still the surface SW "Tiger" wind. There a are a few small patches of rain around, but most of them are out at sea. Looks like today will be a mixture of sunshine and cloud, only the odd small rain shower.